After my big trek to Himalayas, I am so addicted to trekking now, that I google about travelling and trekking places almost everyday. I have already planned and decided the big treks that I should do next, and I was looking for the smaller ones in and around Bangalore. After a research of about 15 days, I came to know about a group called 'Bangalore Trekking Club', who organize various treks, and the expenses seemed to be pocket friendly. I was checking their updates on the group to find a suitable one, and I found that they were organizing a day trek to Rayakottai Fort on 3rd October 2015. I had no one who could join along with me (all my friends were busy) but still I wanted to go since I couldn't control my urge to go out and explore, and so I registered. I thus knew no one who was coming along with me. In the mail, there was a list of 16 girls. I was just excited about visiting a new place, and didn't bother much about who I'll be going with. Rayakottai is about 75 kms from Bangalore, and about 35 km from Hosur. 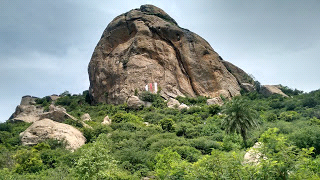 This place belongs to Tamil Nadu, Krishnagiri district. We were supposed to gather in Bangalore Railway Station at 6:40 AM as instructed by our organizer Raja Lakshmi. I went there, and found another girl, wearing a small bag and shoes, waiting near the ticket counter. I went to her and asked if she was here for the trek with BTC, and she said yes. Like this, one by one joined us, and the 14 BTC WOWies were here- Raja Lakshmi the organizer, Shruthi BP (Lambi wali), Shruthi R (Goriwali), Jigeesha (Cow Girl), Juhi (the junior most), Renu (the English girl), Rajitha (Rajjo), Gayathri, Vanitha, Bindu, Archana, Nikhila, Shifali and me. For most of us it was the first time experience with BTC and we were all excited. We boarded Karaikal Passenger at 7:10, which departed at 7:25 AM. We had the introduction session (for formality sake; most of us knew each other by now- of course we are women and can't keep our mouth shut) and then we took a few pics and selfies of the group. We were all talking about various stuffs so loudly, that the people entire coach were glaring at us. All were hungry and we had Idli and Poori for breakfast, which was not that bad. We then walked for about 10 minutes to reach the base of the hill. Our organizer gave us general instructions, and it was decided that Lakshmi would be in the front and Shruthi and I would be at the end. We started to climb, and we took too many pics on the way, and we stopped too often at places where we thought the background was good :-P We also took some group pics, and we finally reached the top at 12 PM. 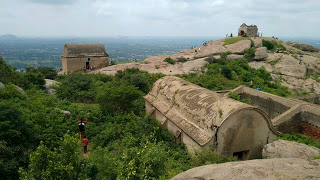 There was a ruined fort at the top, and it is supposed to be Tippu Sultan's Fort. The view is magnificent form the top and we could see some other smaller hills in far off distance. There were also too many people since it was a festive month and the Lord Venkateshwara temple in the hills (which we didn't visit) had too many visitors. We thus couldn't get the privacy that we expected, but still managed to find a decent and huge space to sit for lunch. We had our lunch enjoying the sight, and our English girl had bought a knife and black salt, and she prepared a lemonade which was yumm. We also shared some fruits, chips and other junk items bought by all. We spent some time there, taking photos, enjoying the view, teasing each other and took some group pics, and started the descend at 2:15 PM. We were soon down at around 2:45 PM, and we walked towards the station. We stopped at a juice shop to re freshen ourselves, and we reached the station at 3:45. We had lots of time now to pose stupidly on rails, and we were completing our quota of gaining some more nice DP's and Cover pic's. We then sat on the platform, and we had a feedback session, and we all shared our day's experience with BTC and the WOWies. Everyone had enjoyed it equally, and we all had gelled up very well by now. We boarded the train at 4:40 PM, and managed some seats and then it was time to collect the money, which was 80 per head. Our expenses for the day thus did not cross 150, including the breakfast and juice, for which we had paid individually. We then reached Bangalore at 7:30 PM and we all had to say goodbye, and had a big group hug. Within a matter of 12 hours, we all had become so close and each one of us was eagerly waiting for the next trek to have the same awesome experience again.